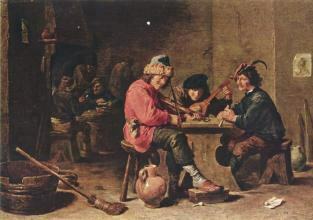 David Teniers the Younger (December 15, 1610 – April 25, 1690), Flemish artist was the more celebrated son of David Teniers the Elder, almost ranking in celebrity with Rubens and Van Dyck, was born in Antwerp. Through his father, he was indirectly influenced by Elsheimer and by Rubens. 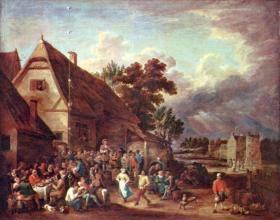 We can also trace the influence of Adriaen Brouwer at the outset of his career. 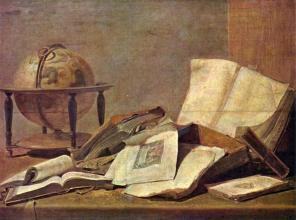 There is no evidence, however, that either Rubens or Brouwer interfered in any way with Teniers's education, and Smith (Catalogue Raisonné) may be correct in supposing that the admiration which Brouwer's pictures at one time excited alone suggested to the younger artist his imitation of them. 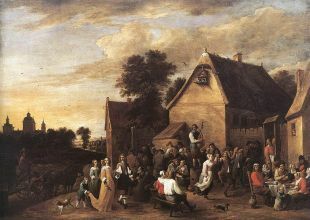 The only trace of personal relations having existed between Teniers and Rubens is the fact that the ward of the latter, Anne Breughel, the daughter of John (Velvet) Breughel, married Teniers in 1637. 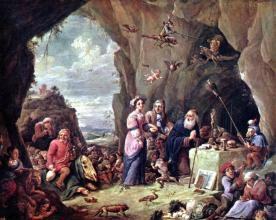 Admitted as a "master" in the guild of St Luke in 1632, Teniers had even before this made the public acquainted with his works. 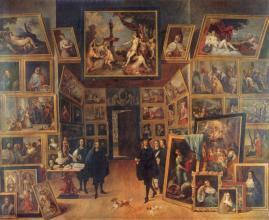 The Berlin Museum possesses a group of ladies and gentlemen dated 1630. No special signature positively distinguishes these first productions from those of his father, and we do not think it correct to admit with some writers that he first painted religious subjects. Dr Bode, in a remarkable study of Brouwer and his works, expresses the opinion that Teniers's earliest pictures are those found under the signature "Tenier." 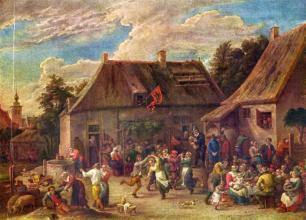 Tenier is a Flemish version of a thoroughly Walloon name, "Taisnier," which the painter's grandfather, a mercer, brought with him when he came from Ath in 1558; and Dr Bode's supposition is greatly strengthened by the circumstance that not only David the elder but his brother Abraham and his four sons were all inscribed as "Tenier" in the ledgers of the Antwerp gild of St Luke. 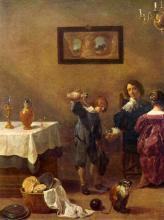 Some really first-rate works--the Prodigal Son and a group of Topers in the Munich Gallery, as well as a party of gentlemen and ladies at dinner, termed the,Five Senses, in the Brussels Museum--with the above signature are remarkable instances of the perfection attained by the artist when he may be supposed to have been scarcely twenty. His touch is of the rarest delicacy, his colour at once gay and harmonious. Waagen and Smith agree that the works painted from 1645 to 1650 testify most highly to the master's abilities; there is no doubt that a considerable number of earlier productions would have been sufficient to immortalize his name.